De Sicas neorealist tale finds the despair of postwar Italy evident in the faces of its men. Though the film also explores how women cope with poverty, it devotes most of its energy to documenting Romes streets and the depressed, unemployed men who populate them, anxiously waiting for work. One such man is Antonio Ricci (Lamberto Maggiorani), who miraculously lands a job hanging movie posters around town. 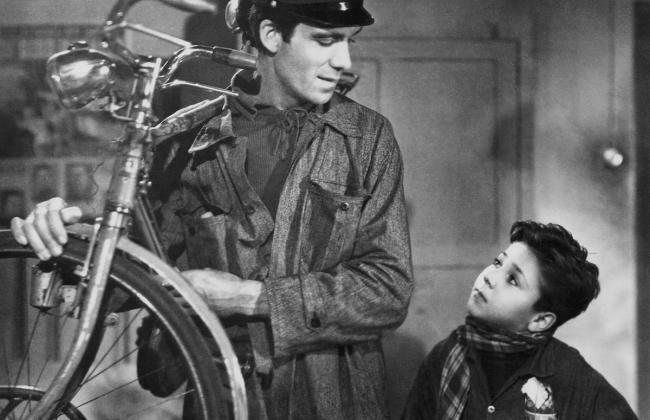 Things go awry after Antonios bicycle is stolen, forcing him and his young son Bruno to scour the city. For De Sica, the severity of Antonios ordeal is as much a crisis of masculinity as it is one of economics; Maggioranis melancholy eyes and hardened face express the hardship of a generation of men beaten by hunger and dim prospects. Youthful Bruno tries to keep them upbeat, but as father and son soon learn firsthand, a desperate man can sink to great depths.